When Bradley Cooper took on the role of Jackson Maine for directorial debut A Star Is Born, he wanted to do it right. It wasn’t simply a matter of acting the character out, it was about inhabiting him. In order to bring this beaten-down country singer to life, Cooper needed to make it real. Maine needed to be authentic, as true to life as possible or close to. And so Cooper went searching for inspiration. During this time, he found himself at a desert festival. It was here, in the south of California’s Colorado Desert he found what it was he had been looking for. Catching sight of 27-year-old musician Lukas Nelson onstage he knew he had found an essential element of Maine. Lukas was playing alongside one of Cooper’s musical heroes, Neil Young. But it was Nelson that caught Brad’s eye. Despite his youth, Nelson was already a seasoned musician and a journeyman – a pro. Lukas had been hitting the road with famous father Willie Nelson since age 13. Maybe Cooper could see that in the artist’s eyes but perhaps he simply liked the way he held his guitar. Whatever transpired, Cooper quickly called Lukas and they got to talking. A contract was drawn up and Nelson was bought in as a musical consultant for Cooper’s film. Lukas instructed the actor on every minutia of the business, from the basics of keeping time to how to walk onstage. Many of Jack Maine’s mannerisms and guitar techniques were synthesised from Nelson’s style. In passing on these lessons Lukas quickly discovered Cooper was a music fanatic just like him. The pair bonded over common interests in Neil Young, Americana and CCR. They quickly hit it off. Lukas became more and more involved. So taken in was Bradley with Nelson’s work he invited him to join he and co-star Lady GaGa in hammering out the backbone of the film’s soundtrack. Together the three composed eight of the movie’s 34 songs. Then, when Jackson Maine needed an onscreen band, Lukas and The Real were more than willing to oblige. Playing alongside the group on camera Cooper looked as if he was part of the band but then again by this point, he practically was. Having fingerprints all over a film so celebrated no doubt works wonders for an artist’s reputation. A Star Is Born imprinted Nelson’s music upon the minds of the movie-loving public. But his story didn’t begin with this Oscar-decorated film and neither does it end there. Lukas and Promise of the Real are still out there, unbound by conformity and cutting music that’s raw ‘n’ true. Harder than ever they work to prove themselves while staying honest to their creative roots. This is a narrative very much still in motion. But looking backward as well as forward, Lukas’ music can draw the listener into his journey so far. In no short order here are ten tracks which can transport their listeners to the pivotal moments of Lukas’ career. ‘You Were It’ was the first song Lukas Nelson ever wrote. The music and melody came to him as he sat on a school bus in Maui, the Hawaiian island where he spent much of his childhood. So impressed was father Willie he included a version on 2004 record It Will Always Be. ‘Sound of Your Memory’ first arrived on Lukas’ 2010 debut album Promise of the Real. Willie guests on guitar and the elder Nelson was again impressed. He later delivered his own interpretation on 2012 record Heroes. Jamming with Lukas and The Real after 2014’s Farm Aid, Neil Young recruited Nelson and his band to become what many Young fanatics have favourably described as a modern-day Crazy Horse. Lukas and company have backed Young frequently on tour. The group also worked with him in the studio recording the politically pointed album The Monsanto Years in 2015 and then assisted him in following up with The Visitor in ’17. Rounding it all out they also assisted in creating a soundtrack for Young’s oddball film Paradox. Lukas’ love of Young’s work runs deeper still. What would become Lukas Nelson Promise of the Real first began when Nelson crossed paths with drummer Anthony LoGerfo at a Neil Young concert in LA. Nelson even named his band after one of Young’s songs, an idea which came to him listening to the lyrics of the opening track of Young’s 1974 album On the Beach while high. Lukas’ musical interests are diverse. While his tastes and inspirations hold little regard for genre, his music itself can shift effortless between styles. ‘Just Outside Austin’ is a fitting example. Here, Lukas plays cosmic folkie as Wille weaves in some guitar lines of his own. Providing A Star Is Born’s pivotal moment, ‘Shallow’ may be sung by GaGa and Cooper but it’s very much a Lukas Nelson song as well. Nelson has described his writing process for the film as one drawing deeply from his own experiences and feelings. He wanted to envision the kind of music he himself would sing if he’d been walking in Jack Maine’s shoes for 40 years. The volcanic blues of this Neil Young-styled rocker is another one of Lukas’ credits on the A Star Is Born soundtrack. It’s also one of Lukas’ personal favourites. He’s been looking forward to working it into his live set. Lukas Nelson didn’t only click with Cooper he also struck up a friendship with GaGa too. Musically they see eye to eye. “She’s got a good sense of songwriting and songcrafting and by anyone’s standards, not just an artist in the pop world,” he said, praising the pop star while in conversation with Billboard last year. Sitting in on the studio session for 2017 album Lukas Nelson and Promise of the Real, GaGa pointed out to Lukas that he could stand to add some harmonies to ‘Carolina’. She’d thought up of a few in her head already and was happy to suggest them. Lukas requested she lay them down then and there. GaGa also lends backing vocals to ‘Find Yourself’. The track plays out like a roots and soul treatment of The Beatles’ ‘Don’t Let Me Down’ but there’s a country slide to it all too. ‘Find Yourself’ is the band’s biggest single to date. 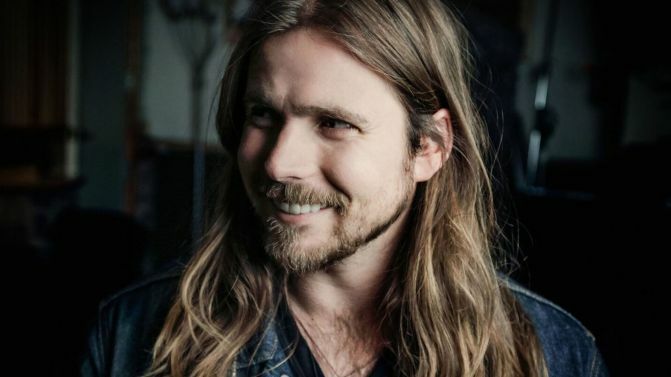 Lukas Nelson & Promise of the Real will play Byron Bay Bluesfest this April. The band have also announced a trio of headline sideshows in Meeniyan, Melbourne and Sydney. Dates and details below.